Saint Patrick’s Day is coming up and like many Americans, I’m part Irish, so maybe I should be expecting some luck. I did find the pot of gold at Capital City Cheesecake Tuesday morning when I dropped in for a cup of coffee and a macaroon while running an errand. It’s a promotion they’re running. Find the cardboard cutout of a pot of gold (which moves around the store from day to day) and you get 15-25% off your order, depending on how many people have found it that day. It felt pretty lucky, even though it was, objectively speaking, a rather small windfall. The satisfaction came mainly from the fact that the last time I was in there I couldn’t find the darn thing. A lot of things affect our perception of luck. 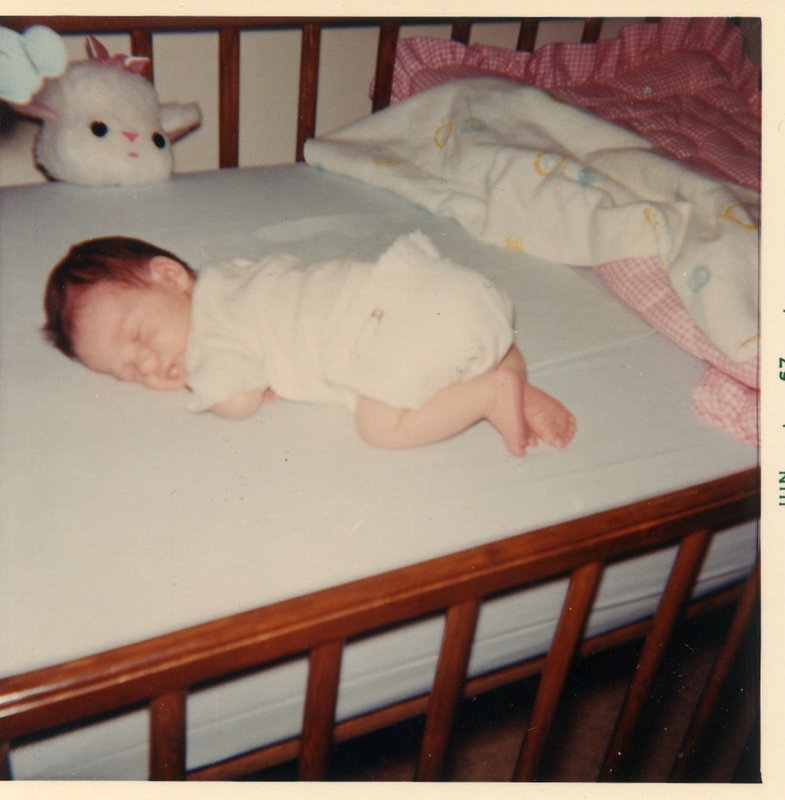 1967: This is an easy one because it’s the year I was born, so that’s clearly the luckiest thing that happened to me that year. I was born in Los Angeles in May of that year to a couple in their mid-twenties, a journalist and a nurse. I was their first child. I don’t remember life in California, as I was two and half when we moved to the East Coast, but we lived near the ocean and I spent a lot of time as a baby and a toddler on the beach. I think this could be why I feel so profoundly at home there. 1977: I was ten and living in Newtown, Pennsylvania with my parents and six-year-old sister. Some time in the beginning of fifth grade I was lucky enough to become close to the girl who would be my best friend for the next several years, including more than a year after we moved away in eighth grade. It took me a long time after the move to make new friends, so that friendship was sustaining, a lifeline really. I used to take the train to visit her for the weekend about once a month. She would come visit me sometimes, too, but not as often. As an adult and a parent, I’m impressed now with her parents’ generosity in having me as a guest in their house so frequently and for so long. In retrospect, I don’t think I was grateful enough. 1987: Another easy one. Late one July evening after a very long and circuitous conversation, I told Beth I’d never had a friendship as intense as ours that didn’t turn romantic. We discussed what might happen if I kissed her. She said she “wouldn’t mind.” Fortunately, I took this for a coy understatement and an invitation to proceed to the kiss. Later she told me she was being noncommittal, not because she didn’t want the kiss but because she was even more scared than I was. I kissed her. She kissed back. The rest is history. 7/15/91: Exactly four years later, in the bedroom of a B&B in Rehoboth Beach, I asked Beth to by my life partner. She said yes. Our commitment ceremony was about six months later. It’s hard for me to even say if getting the prospectus approved that year was lucky or not. I mostly regard my Ph.D as an expensive mistake these days, but I suppose if the committee hadn’t accepted it then I would have spent even longer banging my head against that particular wall, so I guess it will do. 2007: Now here I have to skip right over the birth of my kids because their birthdays have no sevens in them. That’s the random part, folks. So, by this time, I had finished the Ph.D, we’d traveled to all fifty states and our family was complete. Noah was six and June was one. This was the year I started writing this blog, a project I’d considered for years and one that’s been deeply satisfying to me. I feel lucky to have an outlet for my urge to write, and lucky that Beth maintains the site for me. 3/7/12: So, what was the luckiest thing that happened to me yesterday? It was a pretty normal day. I walked June to school because it’s Spirit Week and yesterday’s activity was “Eat Breakfast with Your Teacher” so she needed to be there early. I did laundry, straightened up the house a little, read Les Miserables for book club, exercised, edited a document about growing hydroponic cucumbers and summarized scientific abstracts about treating goiter with iodine. 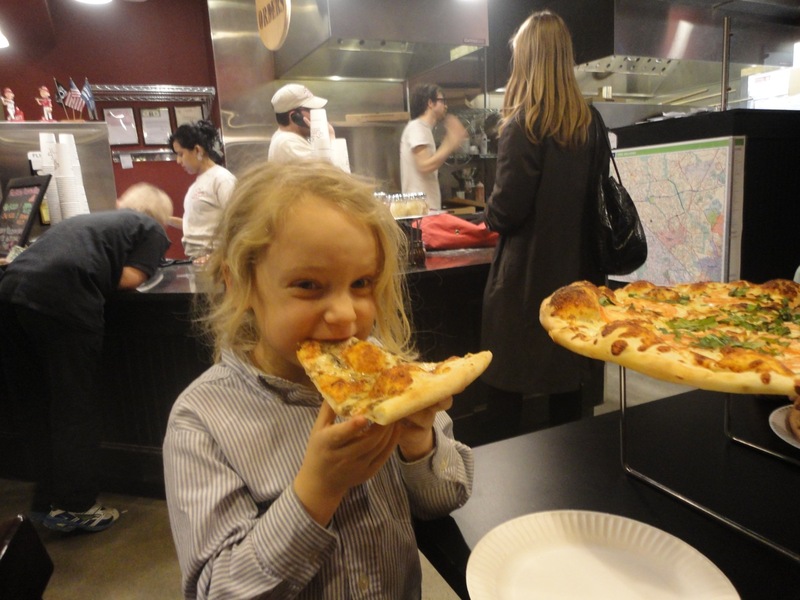 We went out for pizza because there was a fundraiser for Noah’s school at a Silver Spring pizzeria. I think the normalcy of the day might actually be the lucky part—having my family, my work and a bit of leisure. That’s luckier than 15% off a cup of coffee any day. Okay now for the tagging part. There’s no way I can tag fifteen people. I don’t read that many blogs. Seven’s a stretch, as you will see. I just picked the last seven bloggers who commented on my blog, excluding the blogger who tagged Tyfanny because we don’t want this to get too circular, do we? My sister Sara, who is not strictly speaking a blogger, because she has no blog…yet. But she sometimes says she might start one. You can consider yourself tagged in advance, Sara. And wouldn’t seven random things about yourself be a nice way to introduce yourself to your readers? Or alternately, you could leave me a comment with seven random I may not know about you. Lesley, from Child Art Retrospective, another inappropriate choice because her blog is professional and not personal. But I am having fun imagining her list of seven random things she’s learned about art from preschoolers. Maybe leave it in a comment here? Allison, at Bibliomania (http://www.bibliomama2.blogspot.com/). At last, an actual blogger who writes about her personal life (and her life of the mind). She’s funny and engaging and her posts often come back to zombies. I count this as a plus. My good friend Megan at Perpetual Expat (http://mimi37.blogspot.com/), whom I may have already tagged with this very meme before. You did resolve to post more often this year, Megan. Here’s your chance. Jane at Sugar and Puppy Dog Tales (http://www.littleboysaremadeof.blogspot.com/), who just asked for writing prompts. At your service, Jane. Swistle, at Swistle. (http://www.swistle.blogspot.com/). A long shot, as I don’t think she does this kind of thing, but you should all go read her blog anyway. It’s one of my favorites. Laura, from The Diniwilks (http://diniwilks.blogspot.com/) whose last post is another meme, so either she likes this kind of thing, or she’s meme-ed out. We’ll see. Go forth and post. You might even follow the instructions. It’s worth a try. Add the Versatile Award graphic on your blog post. Inform bloggers of their nomination. This entry was posted in Flashbacks, Me, Myself and I by Steph. Bookmark the permalink.